There’s nothing as discouraging slipping into your favorite dress, looking in the mirror, and seeing cellulite. Cellulite doesn’t discriminate and can even affect thin or athletic individuals. It’s typically considered to be a cosmetic problem, although, for the many women who have the condition, it can be incredibly frustrating. According to Health.com “The cosmetic condition affects nearly 90% of women at some point during their lives, even women who are otherwise slender and fit.”(1) It’s true: you’re not alone. It’s possible for men to get cellulite too, as about 10% of men suffer from cellulite (2). 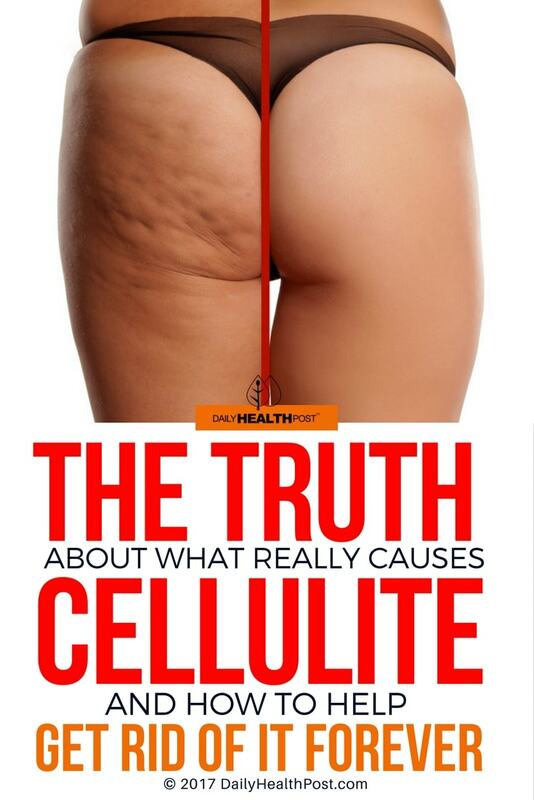 Cellulite is simply a change in the visibility of the fat beneath your skin. It occurs when the fat cells beneath your skin swell and push against layers of collagen fibers or connective tissue. This causes the bumpy appearance of the skin (3,4). Cellulite is common in the thighs, buttocks, breasts, upper arms, and belly. In mild cases, the cellulite is only visible when skin is pinched together. Women are more likely to suffer from cellulite since they have thinner skin, naturally carry more fat, and experience hormonal changes with their menstrual cycle. What’s more, low estrogen during menopause reduces blood flow and thus collagen production. It also makes your body more prone to storing fat (5). If you’re one of the vast majority of women who suffer from cellulite, there are natural non-invasive ways to reclaim your body. Here’s what you can do to reduce the appearance of cellulite and smooth your skin. If you feed your fat cells with processed foods and sugar, they’re sure to grow and be more visible. To shrink your cellulite as much as possible, maintain a well-balanced, plant-heavy diet to maintain a healthy weight and reduce inflammation (7). To improve the health of your connective tissues, consider consuming more bone broth and gelatin. Firming and toning your muscles tighens your skin, shrinks fat cells, and improves the apperance of cellulite. Stretching and strengthening your connective tissue will also help improve their elasticity, which is another plus. If you’re ready to hit the gym, keep this in mind: researchers at the South Shore YMCA in Quincy, Massachusetts warn that regular cardio isn’t enough to keep cellulite at bay. Instead, they suggest a balanced regime of 15 minutes each of cardio and strength training three times weekly (8). Staying hydrated is essential to keep your connective tissues healthy and flexible. It also improves blood and lymph flow to clear toxins. What’s more, hydration can help prevent weight gain. Dry brushing improves blood and lymph flow, and removes old skin cells, which are much less slightly in apperance than newer cells. Think if it as an alternative to massaging. You can use a dry brush before showeirng or taking a bath for optimal benefits. Since connective tissue requires proper blood flow and detoxification. It also helps relieve swelling and fluid build-up (8). Massage affected areas while in the shower or keep a jar of coconut oil in the washroom as give yourself a massage before bed.